I heard an interview on NPR with Elie Wiesel, the famed author, Nobel laureate, and Holocaust survivor, on Thursday. He was asked for his reactions to the shooting which occurred at the US Holocaust Museum on Wednesday. Of course, Wiesel said, he was shocked. But he also asserted that the actions of a deranged Holocaust-denier did not represent a growing body of opinion. In fact, quite the contrary. More people acknowledge and are conversant with the facts surrounding Adolf Hitler's extermination of millions of Jews today than has been true for much of the past six decades. That knowledge is important. For one thing, it reminds us all of the beastliness of which we human beings, looking for scapegoats rather than mutual progress, are capable. But knowledge of the Holocaust also motivates us to actively oppose prejudice and ethnic cleansing every time it's proposed or happns. I've been to the Holocaust Museum twice. I found its presentation of Hitler's "final solution" to be factual, disturbing, and deeply moving. But I also found it inspiring. That's because at the end of each tour of the place, visitors find themselves in an amphitheater where, in a video presentation, interviews with Holocaust survivors are shown. The survivors tell of being liberated from the camps, of the happy lives they were able to live after the horrors they'd experienced, the kindness of their liberators, and their determination to lead lives of love and courage so that what happened to them wouldn't happen to others. It would be a tragedy if the action of one madman prevents people from going to the Holocaust Museum. That's because the shooting on Wednesday demonstrates how much we need the place. By showing people, especially young people, the horrors of hatred and the preciousness of every human life, the Museum can, hopefully, prevent the very madness that came there this week. The Ohio Historical Society is a fantastic organization from which I've learned a lot throughout my life. From it, I've gained an appreciation of the political, social, ancient, and geologic history of my home state. That's important, because without an appreciation for the journey taken by preceding generations, you can't possibly participate responsibly in life today. 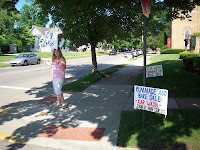 On Wednesday, June 3, 2009 Ohio Senate passed its version of the state budget bill. In a 20-11 vote along party lines, the Senate approved a $53.6 billion budget, which includes cuts to the Ohio Historical Society's Outreach Services-slashed from $703,638 to $0. The Senate also removed $750,000 in funding for historical sites. Now the budget goes to a House-Senate conference committee where the legislature and Strickland Administration try to work out the differences by June 30. What's next? Differences between the bills will need to be reconciled by the conference committee in the coming weeks. Please use the resources below to tell your state legislators how critical the Society's Outreach and partnerships are to Ohio students, teachers and local communities. Contact your state legislator and Governor Strickland now and tell them to restore $1.45 million to the Society 's FY10 budget. Go to this web site to find out what you can do to make your voice heard. History really does matter. Please let the General Assembly know that this is how you feel. 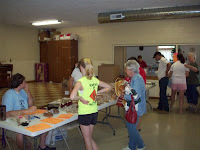 The baked goods were a hit. 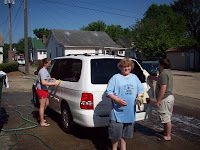 Jen, Critter, and Sam were part of the car-washing crew. 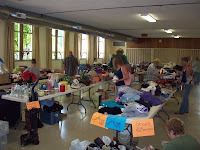 Shoppers rummaging through the rummage at the rummage sale. I recently interviewed Barb Smith, a Logan High School teacher, for an article in our county’s quarterly youth newsletter. An educational veteran with over thirty years of experience, she told me that when she first started teaching, her students had overly high expectations, thinking that the world would and should bend to their desires. “Today,” Smith told me, “I tell students that their expectations are unrealistically low.” She’s shocked by how many think that they can’t have happy, successful lives. Unrealistically high expectations are the result of naive egotism. But unrealistically low expectations stem, quite simply, from fear. Fear is a common element of life these days, it seems. And to be honest, there’s a lot to be afraid of: terrorism; recession; big corporate bankruptcies that could cause millions to lose their jobs; two wars; and a culture that seems to have lost its way when it comes to moral values and common sense. Recent polls show that most American parents are afraid that their children won't have better lives than they’ve had. To yield to fear, to allow it to control our lives, is more than psychologically and physically destructive, though. Fear, quite simply, is the opposite of faith. When Paul speaks here about “flesh,” he’s talking about the world’s way of doing things. It describes all that we do in order to feel important or secure, gain acceptance from others, and even, to placate God. We can be enslaved to the fear that that system breeds, Paul warns us. I once heard a radio report about the World Cup soccer tournament held a few years ago. The reporter said that beyond the competition on the field, this was a big-stakes game between two major world powers: Adidas, the traditional soccer sponsor, and Nike, the up-and-comer in the futbol world. Each company spent about $1.5-billion on World Soccer Cup-related sponsorships. And how would they try to make good on their investments? Through commercials that made billions of young people the world over afraid that if they weren’t wearing three stripes or a whoosh on their shoes, they wouldn’t be cool. Adults are prone to such fears, too. I’ll never forget hearing about the guy who lived in the community where we used to live. He was at an orientation meeting for parents of second grade boys about to embark on their peewee football careers. There was a Q-and-A period and this guy asked, in all seriousness, “What percentage of the children who go through this program end up in the NFL?” That guy was afraid that if his peewee didn’t eventually make it to the NFL, his poor little life would be a bust! The world’s fear system also drives a lot of people when it comes to religion. Their faith isn’t a joyous response to God’s goodness and love, an appropriate use of the gifts God has given them to love God and love neighbor. Instead, they see God as a cosmic commander who must be placated by the doing of certain grim duties: enduring some earnest preacher's sermon, making it to worship often enough, apologizing when they’re wrong, obeying the law. God certainly loves it when we regularly worship, take responsibility for our wrongs, and act as good citizens. But these things don’t constitute faith. So, two simple definitions: Fear is something that we do, something we do to ourselves. And it’s ultimately destructive. Faith is a gift from God, something God gives to those who open their hearts, minds, and wills to Him. And it gives life. Let me expand and explain those definitions a little: Fear is a roiling emotion that causes us to act defensively or in panic. I know all about fear. It still haunts me at times. But I’ve learned how faith can displace fear. It’s a simple formula actually based on today’s Bible lesson: I cry out to the Father, in the Name of the Son, and receive the power of the Holy Spirit. Every time we trustingly interact with God in this way we come in contact with one of the great mysteries of God: the Trinity, the reality that God has been revealed to the world as one God in three Persons. The Trinity is hard to understand. And, I suppose that if you and I fully understood how God could be one while having three personalities, we would be God. And, speaking for me anyway, I know that I'm not God! Instead of fully comprehending God, my call and your call is to trust this God Who has been made known to us as Father, Son, and Holy Spirit. Fear is the belief that we must face life and eternity alone; faith is the certainty that in Jesus Christ, we have been adopted as God’s children forever and never face anything alone. “You’re a quick healer,” a nurse told my Dad at the hospital last week. Dad acknowledged that to be the case, but he had another explanation. “I’ve been visited by four pastors today: the woman from our church, the man who is at my daughter’s church, my son-in-law, and my son.” I know that Dad drew strength from all the praying being done for him, from pastors and churches and prayer chains all over the place. He wasn’t afraid, no matter what happened. I remember one of the key moments of my life when the truth about faith in God began to sink deep into my soul. I was a young pastor, visiting a retired farmer and his wife in my first parish. “Pastor,” the farmer told me, “you could hardly be a farmer if you didn’t have faith. You have to trust that God will send the right amount of rain every year. You have to trust that He’ll send the right amount of sunshine. And you have to trust that, in those years, when the sun and the rain don’t come in the right way, God will take care of you until next year.” That man taught me that when you’re in the hands of an eternal God, there is always another good tomorrow! that the God Who so loved the world He gave His only Son so that whoever believes in Him will live with God forever, will also fill us with a faith that stands all the tests of this world and will carry us into eternity!